Our Voile Cotton collection is made from beautiful, flowy fabric that washes + wears well. Our modern Moonlight collar is a black + white + royal blue masterpiece! Great for girl or boy dogs, this floral collar is super cool!Customize it with an engraved buckle or name plate. This Scarlet collar, made with Rifle Paper Co. fabric, is the dog version of your favorites from J. Crew & Anthropologie. This boho chic floral pattern is super beautiful in orange + navy. Our classic step-in designer dog harnesses are strong in construction, easy to use, and colorful with cutting edge in design. Choose between cotton, linen, canvas, ribbon, denim, flannel, and voile. We want your dog to look good and for you to feel safe. 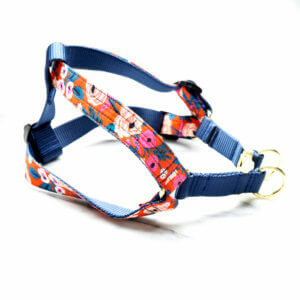 Our designer dog leashes are strong in construction and colorful with cutting edge in design. Choose between cotton, linen, canvas, ribbon, denim, flannel, and voile. We want your dog to look good and for you to feel safe.